In Conquest of the Fallen Lands, you and your fellow players have a task to free a land invaded by vile hordes of monsters, and win back the treasures they plundered. 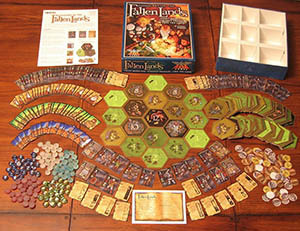 The game board is composed of hex tiles representing orc scouting parties, encampments, fortifications, dragons, etc. Each tile has a difficulty level. Players take turns conquering these tiles by playing troop cards on them. Each conquered tile creates new opportunities to tackle tougher tiles around it, both for you and your opponents (so you have to be careful!). Conquering a tile gets you a reward equal to its difficulty level. This money is used in the game to purchase assets and abilities, and it is also used to determine who has won this game, once it´s over. A number of magic cards introduce a variety of special effects and abilities that can greatly benefit the players. - The Normal game is very accessible; it is a lighter game that plays with little downtime and yet has a lot of strategic depth. - The Advanced rules lead to a more complex game that can sometimes be a bit of a brain burner. It also moves at a much slower pace.